In September of 2014, OSHA released the list of the Top 10 Most Frequently Cited Standards for 2013-2014 — and for the fourth year in a row, Fall Protection was the number one most frequently cited OSHA incompliance. In 2013 alone, 574 fatalities were directly due to accidental falls. Inadequate protection is an offense that results in some of the heaviest OSHA fines, with penalties oftentimes exceeding $100,000. “Occupational fatalities caused by falls remain a serious public health problem. The U.S. Department of Labor lists falls as one of the leading causes of traumatic occupational death,” OSHA's website reports. In order to keep employees safe and companies protected from hefty OSHA fines, a reliable fall protection system is necessary. OSHA requires fall protection be provided on any walking/working surface four feet or greater above the next level in general industry and six feet or greater above the next level in construction. What exactly is meant by fall protection? How can you achieve it? There are three main categories of fall protection, each with its own risks and benefits: fall prevention, fall restraint, and fall arrest. Fall prevention is achieved either by eliminating the risk of a fall completely or by placing guardrails to prevent a person from falling off an edge (sometimes called passive fall protection). Fall prevention systems may be permanent installations or more mobile, versatile options such as work platforms. Fall prevention, such as work platforms or maintenance stands, is OSHA’s preferred method of fall protection because it is the safest — there is virtually no risk of an accidental fall. The advantages of a fall prevention system are great. First and foremost, you don't have to worry about dangling or hanging lines that could interfere with work efficiency, as work decks provide unrestricted areas to move about. Some work stands even provide protection against falling to the ground when walking on the equipment itself, creating a perimeter “safe zone” which enables workers to move efficiently to and from the work zone. Fall-prevention work stands, also referred to as work platforms or scaffolding, can be customizable to your company's particular needs. 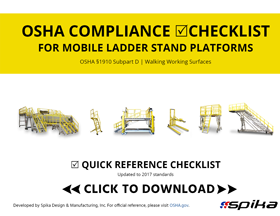 Features such as safety gates and safety chains, adjustable-height decks, staircases and ladders, telescopic guardrails, extension sliders, tool trays, lifting columns, and heavy-duty casters create a work space that is not only OSHA-compliant, but also keeps your company safe, productive, and efficient. The upfront costs for fall prevention systems are greater than for alternatives, and may include design, product, shipping, installation, and other costs. However, continuing maintenance and training costs are almost non-existent. When guardrails are impractical, falls may be prevented through a fall restraint system. Fall restraint prevents falls by tying a person off so that the edge cannot be reached by utilizing a harness and a lanyard tied off at a set length from an anchor. Fall restraint systems allow for less flexibility and require extensive training, customization and maintenance, and considerably limit the mobility of the worker. Overhead obstacles, such as rotor blades, reduce the practicality of these systems, as workers are not allowed to disconnect the tether from their harness to pass under the obstacles. 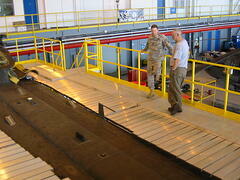 This option isn’t very expensive upfront, but training and maintenance can be substantial. 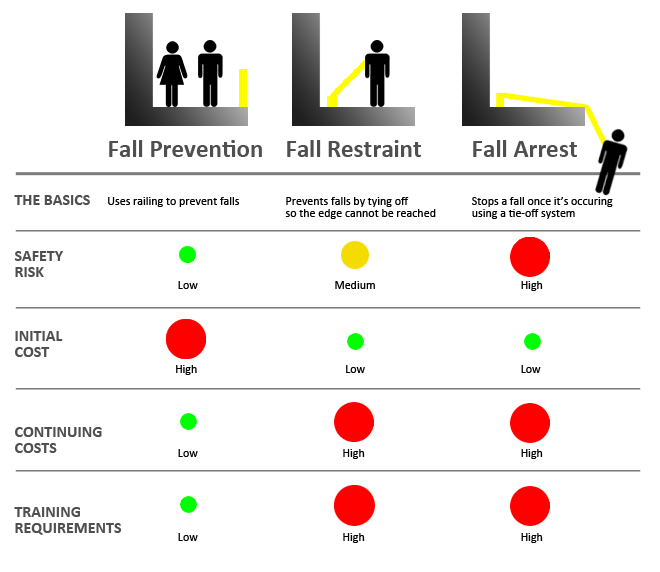 In addition, there are more risks involved with a fall restraint system than a fall prevention system. The final type of fall protection is fall arrest, which stops a fall once it’s occurring. This is accomplished through a tie-off system. Fall arrest has the greatest safety risk of all options. These risks include the danger of contacting other objects during the fall, the danger of improper use or maintenance of the equipment leading to a complete fall, and the danger of leg suspension trauma if the person is not rescued in a timely manner. Fall arrest systems also require rescue, which carries its own set of risks. Fall arrest systems have high maintenance and training costs, although the initial investment may be low. Despite these concerns, fall arrest may be the only option in certain circumstances. In the end, best practice is to use fall prevention systems whenever possible. The higher safety risks of fall restraint and fall arrest should only be accepted when fall prevention is impossible. If you're interested in fall protection, you may also want to check out the 5 Key OSHA Standards For Work Platforms.